7Pcs/Set Moisturizing Beard Care Grooming & Trimming Kit: Natural Organic Beard Balm, 30G Moustache Wax, with Scissors, Comb, and Oval & Round Beard Brushes. This beard care grooming trimming kit features seven products to help keep all types of beard well maintained and polished. 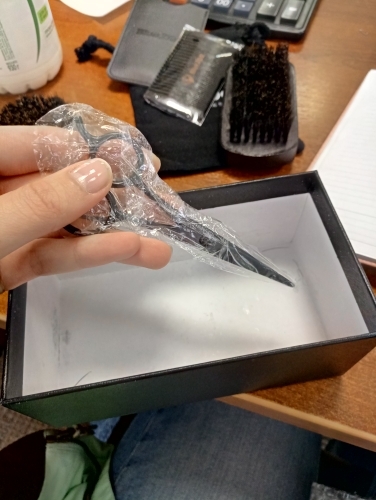 It includes three different beard conditioner balms, two beard brushes, a dual-side beard comb with a leather bag, and mustache scissors. All of these beard grooming products work together to create skin and beards that are moisturized and immaculately kept. 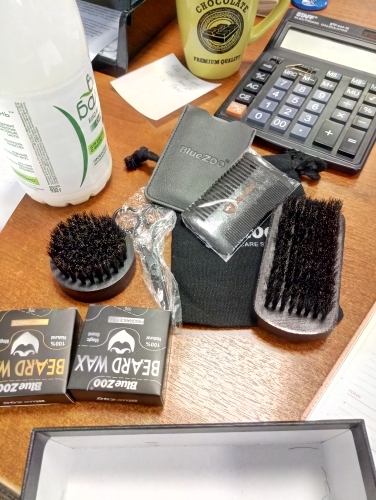 This beard grooming gift set is perfect for any bearded person in your life – it makes a great stocking stuffer or a fun pre-Christmas gift to make sure they’re looking dapper for holiday gatherings. 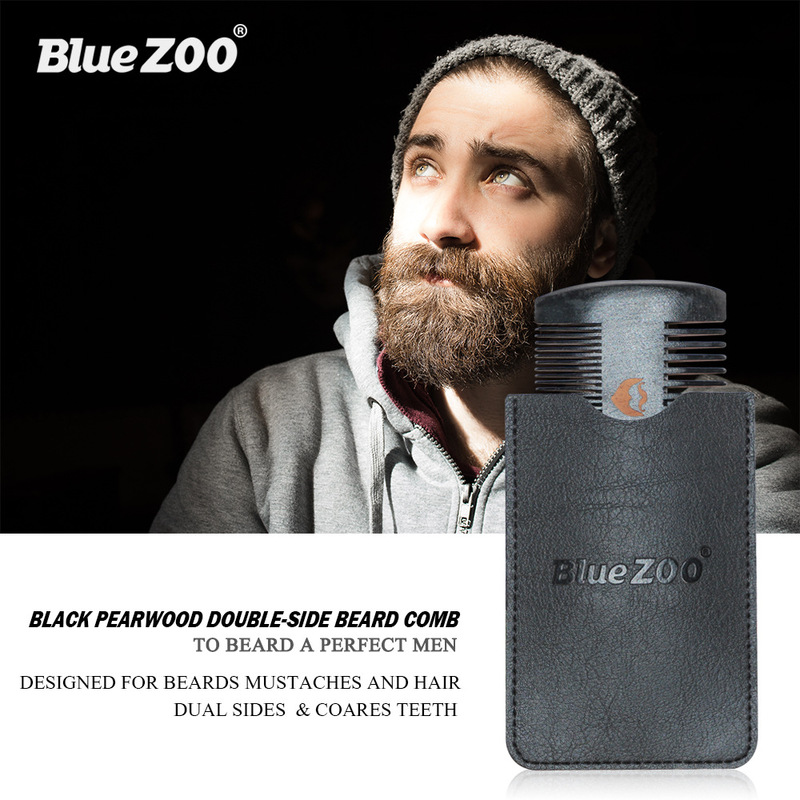 Product Name: Beard Care Grooming Trimming Kit for Men Styling. Ingredient: Cera Alba (Beeswax),Butyrospermum Parkii(Shea Butter), Simmondsia Chinensis (Jojoba) Seed Oil, Persea Gratissima (Avocado) Oil, Argania Spinosa (Argan) Oil, Cocos Nucifera (Coconut) Oil, Rosmarinus Officinalis (Rosemary) Extract, Tocopherol (Vitamin E),Sweet Orange Essential Oil(Sandalwood Essential Oil), (Eucalyptus Essential Oil). Nourish, care for beards, give the beard nutrition. 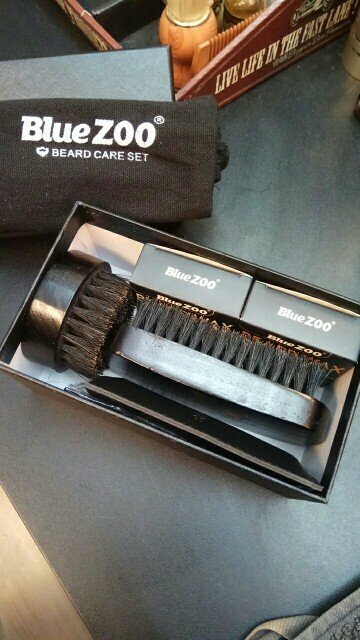 Styling, make it easier to take care of the beard. Different fragrances to make different beard exudes charm. 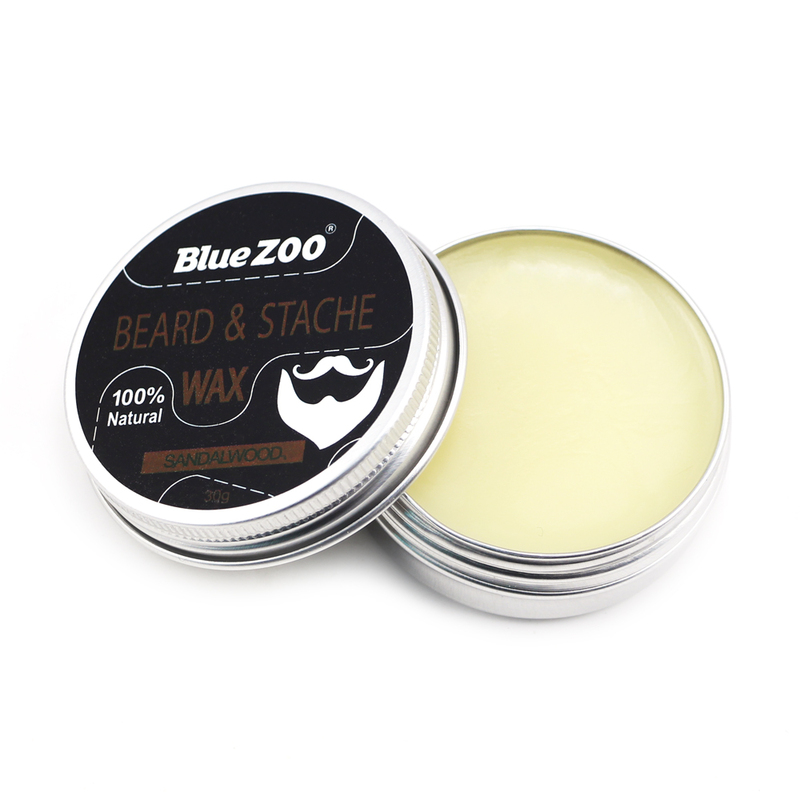 2 x 30g/box Organic Beard Wax (Sweet orange + Flavorless). 1 x Pearwood Dual-side Beard Comb（Black color, Size:12*5.8*3.8cm）. 1 x PU Leather Bag for Comb（Black color, Size:10.8*7.2cm）. 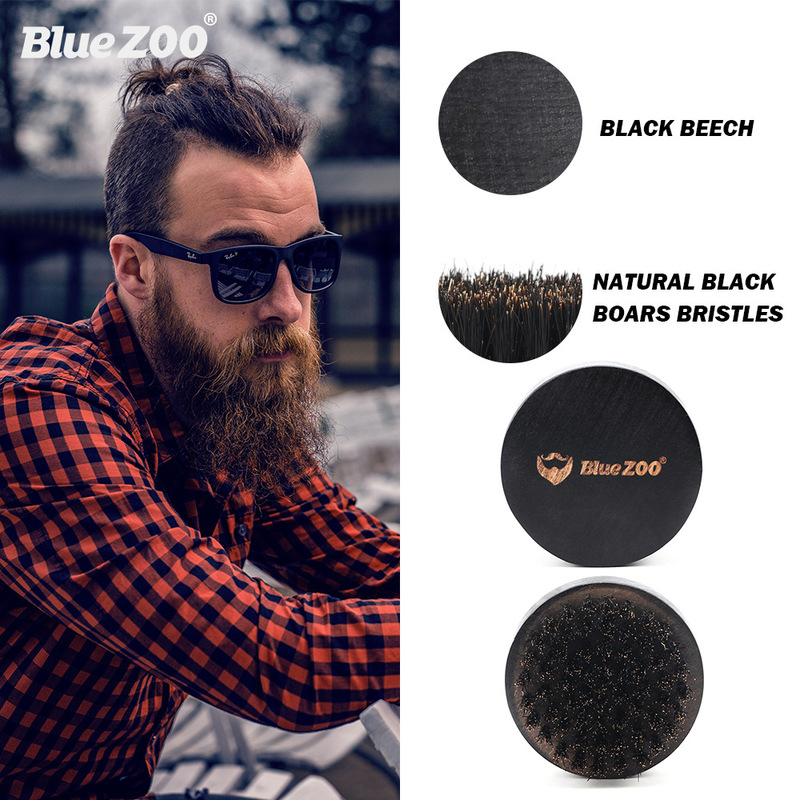 2 x Beech Beard Brush（1Pc Oval – Size:12 x 5.8 x 3.8cm; 1Pc Round – Size:3.8*6.5cm; Color: Black）. 1 x Stainless Steel Scissor（Black color, Length:12.2cm）. 1 x Canvas bag（Black color, Size:12.5*17cm）. 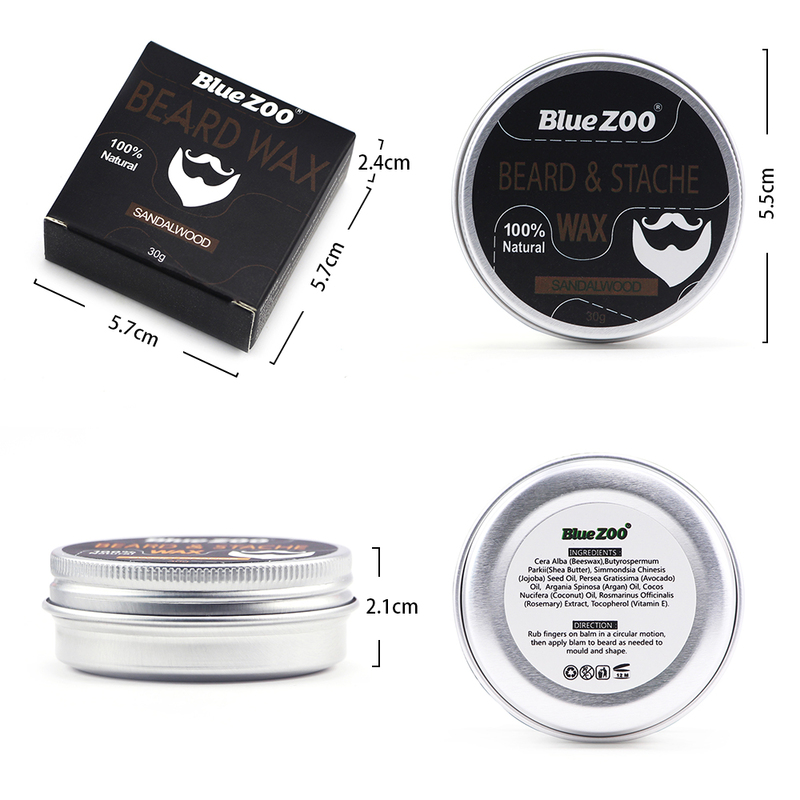 3 x 30g/box Organic Beard Wax（Sweet orange/Sandalwood/Flavorless）. 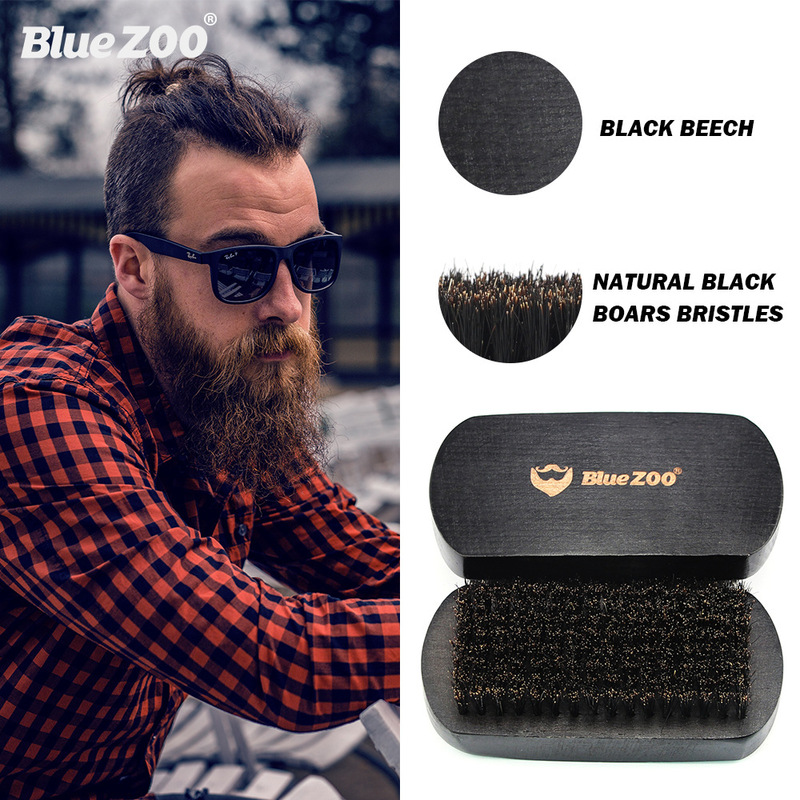 1 x Oval Beech Beard Brush（Black color, Size:12 x 5.8 x 3.8cm）. 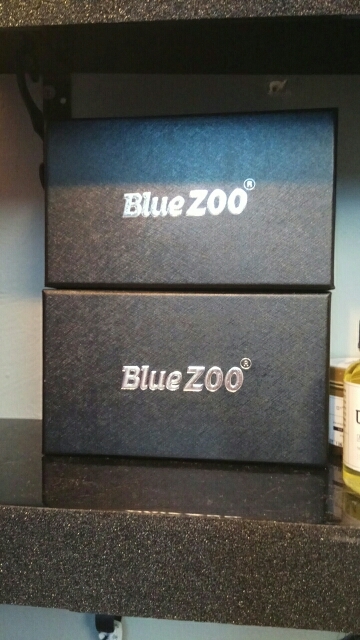 NOURISH, THICKEN AND STRENGTHEN YOUR BEARD – Blue ZOO Beard Balm contains active ingredients such as Mango, Shea Butter, and other nutritious oils that nourish and strengthen your beard by trapping the moisture into the actual hair follicles and pores to facilitate growth for a thicker and more mature beard. Helps to relax your beard making it more manageable, taming the “fly-aways” to promote a strong sleek look. NO MORE BRITTLENESS OR SCRATCHINESS- The carefully chosen minerals and oils in the Beard Balm keep your hair follicles and pores from drying out which gives your beard that lovable, silky smooth feel. NOT TESTED ON ANIMALS, ALL NATURAL. 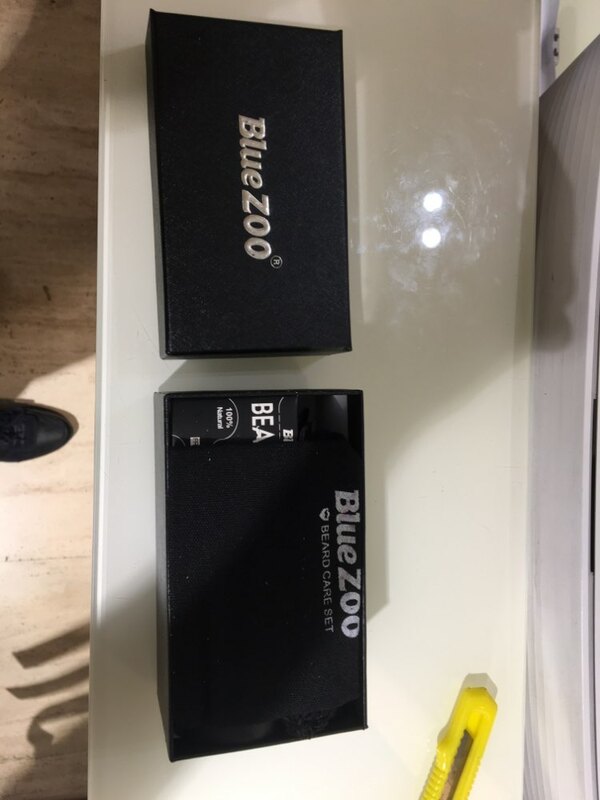 Blue ZOO beard balm helps to tame your beard reducing those pesky flyaways and unruly hairs, while deeply conditioning and protecting your manly mane! 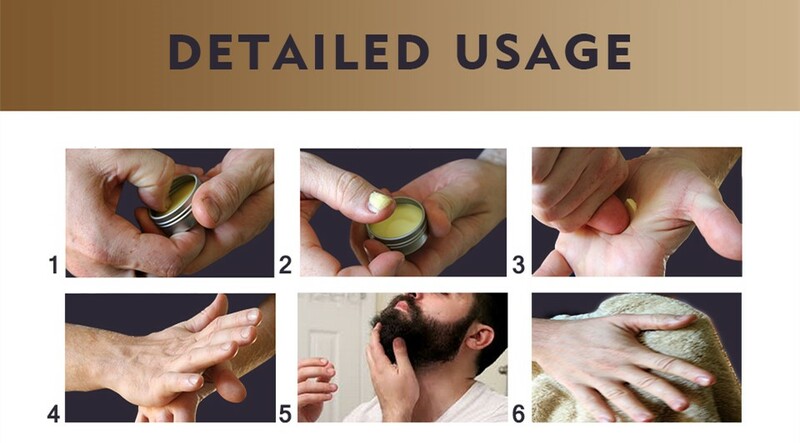 Rub fingers on balm in a circular motion, then apply blam to beard as needed to mold and shape. 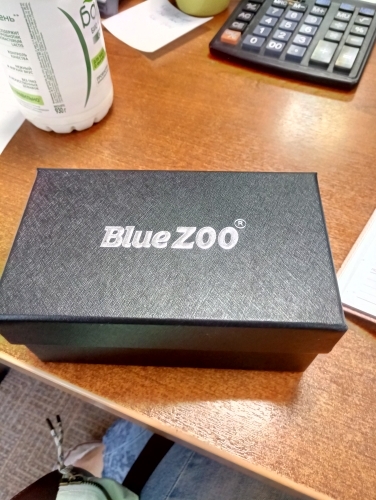 Very high quality product and fast delivery ⭐⭐⭐⭐⭐ Very pleased and ordered 2 sets arrived perfectly and qualitatively. Reçu dans une boîte impeccable, bonne qualité. Brought very quickly for 10 days! I advise everyone! ordered 19.08 came 30.08 in the St. Petersburg. all miniature waxes smell delicious, as in fact use the reported result.